I’m laptopping you today from Goethe’s chair. I’m in his “poetry room” here in his family home in Frankfurt. The five-story building, leaning out over a street called Grosser Hirschgraben, was restored after WW2. The surrounding buildings are now a museum and one of the main attractions in this city. Here are manuscripts, drawings, paintings, childhood toys — a furnished interior locked into 1749. There’s a library, picture gallery, theatre and conference center. On the third floor I bumped into a shaggy young poet, his eyes on the ceiling, notebook and stubby pencil in hand. In the library I watched Japanese schoolgirls copying his drawings and giggling at his poetry. 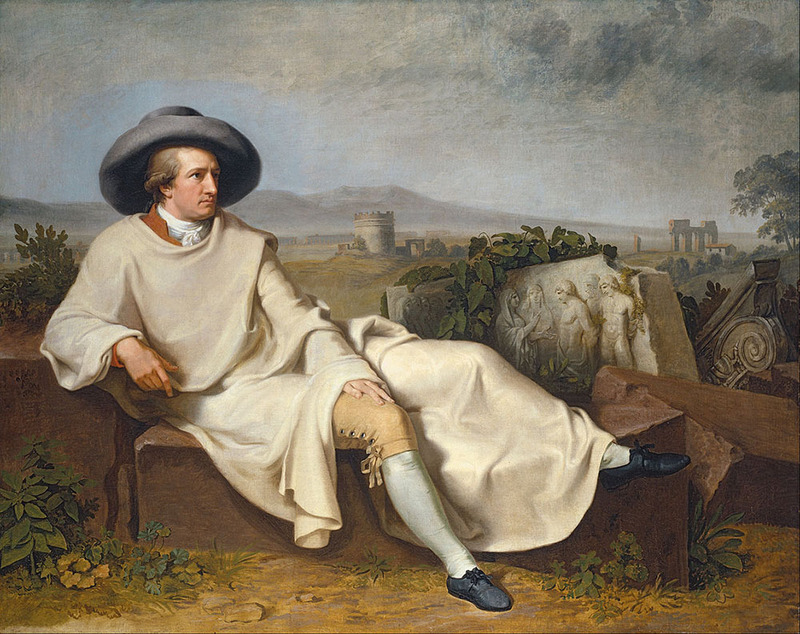 Goethe, as you might have guessed, is one of my favourite guys. He is, of course, a universal hero — celebrated in books, festivals, plays, conferences and websites. The artist has superceded himself. This in part because he loved connectivity and understood the viral nature of culture. He cultivated the bright and the influential. He travelled in search of love and beauty — seeking to understand and unveil. He enjoyed writing letters, honing sentences, turning phrases. His life and his life’s work became the kernel of an institution. Like Picasso, Vasarelli, Klee, Wordsworth, Shakespeare and other creators he is now anchored by a piece of real estate. Everyone owns him. Today, in the surrounding countryside, the Riesling grapes are off the vine and well-dressed strollers pause to take the sun-filled views. Apart from the distant roar of traffic on the autobahn, things are pretty much as they were. Everything, everyone is attractive. Beauty, decency and pleasantness prevail. Children fill the air with laughter. Travellers pose. Lovers kiss. The world is in the business of finding its artists. Esoterica: According to a recent survey by the Organization for Economic Co-operation and Development, Germany tops the nations with 84.7 websites per 1000 people. Denmark and Norway follow with 71.7 and 66.4, while the US, UK, and Canada all hang out pretty close to 60. If he could have, Johann Wolfgang von Goethe would have been online. He is now. This letter was originally published as “Universal artist” on October 31, 2003. The fastest way to become a Universal Human- a Universal Artist- is to do the Inner Work necessary to Awaken the SELF. Illumination and/or Enlightenment are then possible states of attainment- and KNOWING potentially becomes Reality. However- most humans never venture that far down the road- and most only take on Self-Work when faced with insurmountable tragedy and/or states of depression and despair. Most are content to live with the belief structures they were programmed with as children- the religious and political views of their parents and the traditions of their ancestors- which- in my opinion- are dead-ends. Wake up- kids. Find your TRUE SELF. They say that 2016 is the year to do work on our inner selves and our shadows. What we do in 2016 will set the tone for the next 9 years. I find the more work I do to find my true self, the more inspiration for my art work. Hi Jan, if you are interested in working on your inner self this year and change the way you see things, try “One Little Word” with Ali Edwards. It’s an amazing concept and it works. There you go Bruce… become the watcher of your thought stream. Goethe was a searcher after truth and beauty. He understood that creativity and success are lifelong pursuits, and that we never stop learning. He is one of my heroes as well, along with Tim Berners-Lee, the brilliant British scientist who gave us the World Wide Web. Tim’s generosity in making the Web free to everyone is the most marvelous gift to the world, making sure that creativity can be shared without boundaries. Success and creativity are both the result of the steady achievement of meaningful goals. My personal connections between my visual art and other art forms include some wonderful local poets, dancers, mucisians and other artists. I love the call and response feeling when creating, not just making another form or another representation.